Where are you from and how did you become a cinematographer? [Ian] I am from East Boldon near Sunderland in the North East of England. My first degree is in Mathematics and it took a while to find my way into a more artistic world. After several meanders I ended up at the Royal College of Art studying film. I managed to direct a few short films and do camera for many more. Since then I have enjoyed both documentary and drama camerawork with each informing and advancing the other. How did you approach the cinematography of Seachd? What was it like working with HD for the first time? [Ian] With a 35mm camera you are looking directly through a beautiful lens and seeing the scene in colour and can trust your eyes as part of the photographic process. With an HD camera you are looking at a tiny black and white image through the viewfinder so you need a large (ideally 24") HD monitor to properly judge what you are filming. This is huge and totally impractical with such a small crew and low budget so we managed with a 14" monitor a fair amount of the time but up a mountain or on a remote beach only a small battery monitor is possible. This was very frustrating and led to some things that could have been better. HD is horrible looking if any area is overexposed. This proved most problematic in the 'Spaniard and the Gael' story which we chose to shoot on very wide lenses meaning there was a lot of sky in the shot. Unfortunately the skies were particularly flat and overcast but relatively bright white. The biggest advantage to HD was being able to travel a lot lighter with a couple of zooms up the mountain for instance and being able to film 2 hours worth of material with no worries ( which would have been roughly 12 huge cans of 1000 feet of film to carry and load). 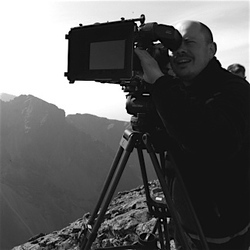 It also meant Simon and I could go off at weekends and film landscape shots and pickups very easily. [Ian] Storytelling is a huge part of life from an early age. Its a way of finding meaning in the world. For a child it’s a way of understanding the world through metaphor – not that a child thinks of it in that way. If the world blew up and the few stragglers met up it wouldn’t be long before they gathered around a fire and someone started telling tales to make sense of things. Stories entertain, provide an escape or catharsis, stimulate thought and debate and make you laugh. What was the best thing about making Seachd? [Ian] The best thing was being up in such a beautiful part of the world working on a script that used the landscape as part of the story. Climbing the mountain twice then filming was a great challenge for a mostly unfit chubbster - the first time was hellish with snow on the ground, gale force winds nearly blowing the tripod over and heavy cloud cover blocking the view. Luckily the clouds parted for a while and the views , light and skies were the most dramatic I've ever seen. I was so tired climbing back down that I wanted to crawl to be honest but pride kept me stumbling along. The second time was very different, beautiful weather and getting up and down was so much less exhausting. The only problem this time was a queue of folk waiting to climb the pinnacle (even though we set off at 3 in the morning). A buttock clenching moment (apart from forgetting the base plate for the tripod!) was Simon pointing out that the rock I was resting myself and the camera on (to get the very wide shot of Angus at the base of the pinnacle) was the kind that crumbles away sending me with it. A vivid very long couple of minutes followed but it was the only place to get such a wide shot. The two climbs were radically different and I'll never forget them. [Ian] The first day of the horse race on the beach. The horses took so long to get onto the beach that we on the camera crew were reduced to making beards out of moss and a feature length documentary on clouds (some very fine clouds though). When finally the horses lined up and the starters gun went off they promptly scattered in different directions. Then the Start/Finish banner blew down and the apocalyptic weather began. Can you tell us a couple of interesting/little known/behind the scenes things about the making of Seachd? [Ian] Simon is certainly one of the hardest working directors I’ve worked with but I think I found his limit one Saturday night. We were filming landscape and pick-up shots in evening light and had a choice to go to the E.I. (Eilean Iarmain: the great local pub) where some of the crew were tucking into lamb shank and downing some fine beer or head off into the twilight. The light looked too tempting though so we headed off towards Elgol and thank goodness we did because the light over the Cuillins was astonishing. Deep red light was bouncing off them making them glow against the black sky. There were so many midges we had to set the camera running and run around to draw them away from clustering around the camera. We shot for ages and the light was low but still great approaching midnight. I tried to get one last shot with long grass in the foreground when Simon suggested we had enough and should go, words I never thought he’d say ! (The shot was a nice one and made the final film). Have you worked on anything since Seachd? [Ian] Since Seachd I’ve filmed the film backgrounds to an Opera set on St.Kilda. It was a great experience to film in such a remote and interesting place. I've filmed a half hour comedy for Channel 4 : 'The Smallest Game in Town' and I’ve also filmed and edited a half hour documentary in Iran about a cleaning lady who works in Tehran. I have recently been DoP on a low budget feature about asylum seekers in Edinburgh called ‘Trouble Sleeping'.